I quit smoking many years ago and never really smoked much when I did, only socially, but I still get that craving. Just the act of smoking used to be soothing to me. The oral fixation I guess you could say, is what got me most addicted. I think more so than the nicotine. It wasn't incredibly hard to stop, but that need definitely still lingers with you! I don't think one ever really fully gets rid of that. Well, things have been really stressful lately and I have craved it more! Fortunately, I was contacted by an e-cig company, just in the nic (git it ;)) of time. I'd never tried an e-cig before, but heard lots of raves over the years and I was excited to be able to try one. 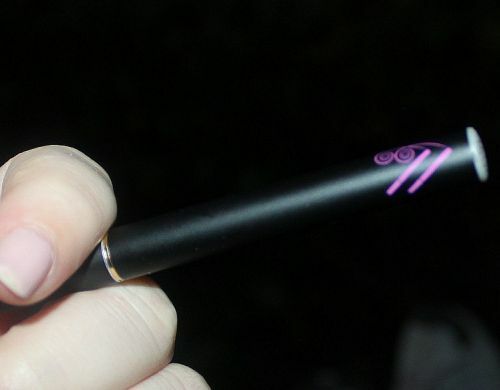 Vaping Vamps is not your average run of the mill e- cig . It is targeted to the classy women who may or may not be trying to quit, but just have a healthier smoking addiction. Yeah, I know it sounds silly to say that, but it truly is healthier in every way. The e-cigs carry nicotine, sans any harmful carcinogenics that are found in an alarming amount in regular tobacco cigarettes. With these e-cigs, you are literally inhaling vapor and nicotine OR you can opt for the non-nicotine variety, which I did. The taste: Vaping Vamp cigs come in a variety of amazingly tasty flavors. I was impressed by this. I chose the Mango and Mint Julie cartomizers. These are what attach to the rechargeable cigarette and bring on the vapor and flavor. The design: So sleek and definitely appealing to your average woman. I love the creative emblem with the V's made out of Cigarettes. I always appreciate clever graphic art. The purple and black combination really fits my fancy, as both are my favorite colors. I think some guys would get in on this too, just for the black design. It's very futuristic looking too and I love that aspect. Gone are the days of the boring looking, let alone harmful cigs. The performance: This definitely takes getting used to, but not very long at all. The reason I say this is because It makes a crackling sound when you first inhale. Of course I didn't know this was to mimic the crackling of a regular ciggarette and so I thought maybe something was malfuctioning. Then it occured to me, this is probably normal. It also has a soun when you inhale. Hard to explain, but you know, air coming through the tube. It lights up a really cool sapphire blue every time you inhale, which lends to its futuristic quality. You know when it needs charging if it doesn't light up. One major thing I don't like is when the cartomizer goes bad. It doesn't just go bad, but you have no idea when It will go bad and more than likely will do what I did and that is inhale the nastiness of it. Its like smoking the filter of a cigarette , but worse. It would be helpful to have some kind of warning before it does go bad, such as another color that lights up or blinking. I really didn't enjoy that part. The Cartomizer: The website states they last 10-15 hours and I'm not sure if that is typical of most e-cigs, but I did get about that many smoking sessions out of it. The cartomizers come in a pack of 5 and cost $3.95. They come in 3 different nicotine levels. That will last a casual smoker quite a while and I think that's a good price. I did try out one medium nicotine cartomizer, because I felt that the non-nicotine wasn't giving me enough for a "throat hit". When all was said and done, I actually prefer the way it was before. The nicotine version was too much for my throat. The rechargeable battery: This is very convenient, it just plugs right into your USB outlet. They also offer a car charger. The price: At $35 for a starter kit, I would say it's a great investment, but the cartomizers will have to be repurchased rather frequently if you are a heavy smoker. For me, I am very casual. Overall, I liked this e-cig. Despite the after math of what happens when you inhale a bad cartomizer. I love the flavor choices a lot. My favorite would have to be the mango. Very true to its name. I would say that I will probably repurchase if this breaks in the near future. I absolutely love the design and the healthy aspects behind this. I also love that smokers who want to quit will have a much easier time than in the past. Most smoking is banned inside, but you can freely vape all you want. What's also great is tha lack of smoke stink! Now you can smoke around friends who hate it. I loathed having to wash my clothes more than once to get the smell of smoke out. That is another great incentive. I believe e-cigs will be a huge wave of the future in replacing regular cigarettes for a healthier way of life. RIGHT NOW, you can save $5 on your first purchase with their Facebook coupon or with CODE: Vamp5 and you get FREE shipping on all starter kits! If you'd like to learn more about Vaping Vamps, you can follow them on Facebook and Twitter. Thank you so much for reviewing our products and I'm glad you love the mango flavor! We just got our cartomizers in, so let us know when you need more! And we're running a special through April 15: get a FREE e-cigarette case when you order a Deluxe Starter Kit from Vaping Vamps (www.vapingvamps.com) with the code "Vamp Case." Thanks again and happy vaping!